Each summer I eagerly anticipate our tomato harvest. I get my starts as soon as they appear at the local garden store, plant them in composted beds when winter’s frost has passed, and patiently bide my time as they rise to fill the tomato cages. Apparently the growing conditions in my backyard have been perfect, because this year’s juicy, sun-ripened crop is bigger than ever! Past favorites like Juliette, Early Girl, Black Krim, Sweet 100, and Sungold, are sharing center stage with a mix of unique heirloom varieties (Ivory Egg, Violet Jasper, and Purple Calabash) gifted to me by a seed-saving friend. You don’t have to garden to take advantage of the season’s windfall. 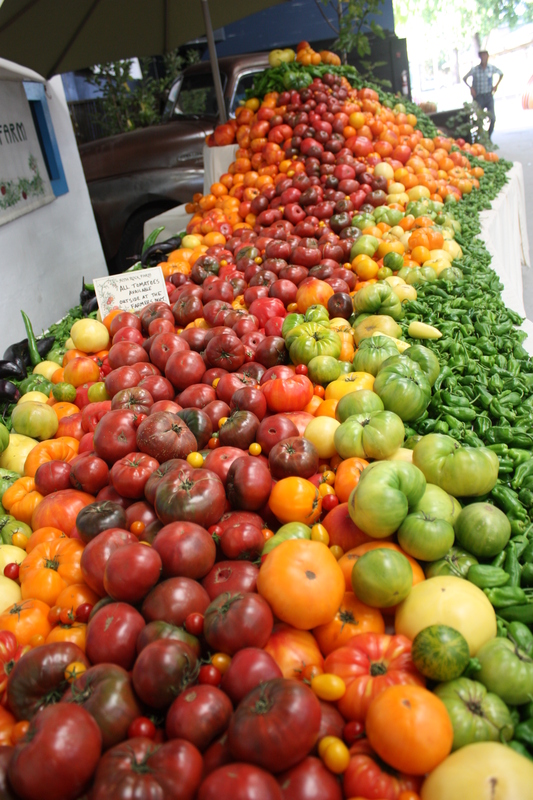 If you’ve visited a local farmers’ market lately, you’ll find vendor booths stocked with an amazing array of varieties to choose from: Brandywines, Japanese Black Trifele, Sun Gold, Sweet 100’s, Green Zebra, Black Krim, Cherokee Purple, Black Cherry, Pineapple, San Marzano, Early Girl, Yellow Pear. . .the list goes on, and on! 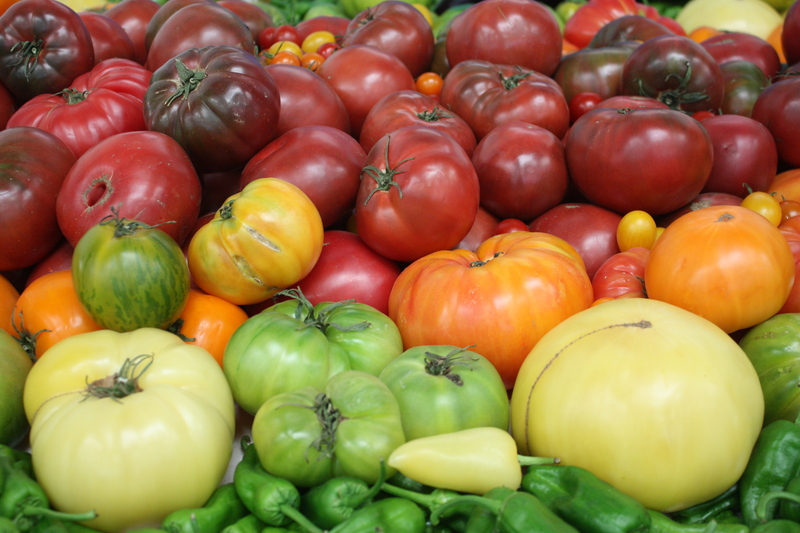 With an estimated 3,000+ heirloom tomatoes in cultivation, there is literally a tomato to suit every palate. Finding creative and tasty ways to use the abundant harvest is always a challenge. 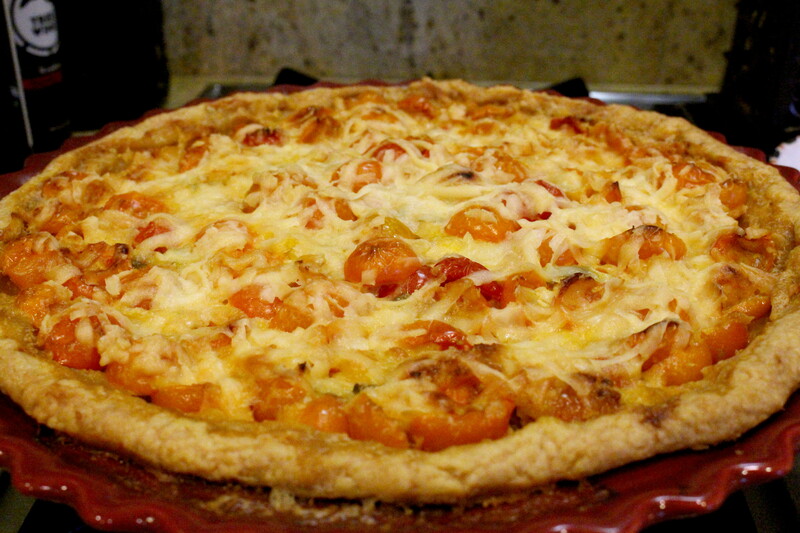 If you’ve been rewarded with a bumper crop of ripe tomatoes, try making tomato pie. This savory recipe is the perfect way to showcase the season’s bounty, and has become a family favorite in our home. *My dear friend Susan Lustenberger makes a killer version of this dish. She inspired me to experiment, and this recipe is the result. 2 cups grated cheese of choice (mozzarella, cheddar, provolone, Asiago) or a combination thereof. 1. Lightly salt sliced tomatoes and allow to drain in a colander for 20 minutes. Rinse and pat dry to remove excess moisture and juice . DO NOT skip this step or your pie will be soupy. 2. While the tomatoes drain, sauté sliced onion in 1 tablespoon olive oil over low heat until caramelized, about 15 minutes. Set aside. 3. Prepare the crust. Preheat oven to 350. Lay pie dough in a 9″ pie dish and crimp edges of crust. Prick the bottom and sides with a fork to prevent bubbles. Pre-bake crust for 10 minutes. Remove from oven and allow to cool for 5 minutes. 4. Mix mayonnaise, pesto, garlic, and a couple grinds of black pepper. Add 2 cups grated cheeses and stir to combine. 5. Layer ingredients in two layers in the baked pie shell as follows: tomatoes, basil, onion, and cheese/mayonnaise mixture. 6. Finish by sprinkling Parmesan cheese on top of the cheese/mayo combination. 7. Bake on center rack of oven until browned and bubbly–approximately 40-45 minutes. 8. Remove and allow pie to cool for 5 minutes before slicing. Enjoy! Looking forward to trying this one Karen. This is funny, it was Susan Lustenberger pie from a few years ago that inspired me to create a savory tomato pie as well. She is such a good cook! Yes she’s a natural Heidi! This recipe comes pretty close to hers I think, except there’s no top crust (which means fewer calories). I love tomato pies – any way, shape or form. This looks like a killer pie in its own right. This is also a great way to use some of that basil growing in the garden. Looking forward to making this recipe.